Samsung has revealed details about two new tablets today at an event in New York City, ushering an 8.4-inch and 10.5-inch Galaxy Tab S into its ever-growing ranks of devices. The new Super AMOLED display-equipped devices make no bones about the fact that they’re aimed squarely at the consumer market and both share the same kind of rear panel design seen on the Galaxy S5. Nevertheless, despite being aimed at a ‘consumption’ crowd, both do include Samsung’s Knox security and pre-installed office software for dealing with documents on-the-go. Both devices share the same WQXGA (2560 x 1600 pixels, 16:10 ratio) display, which Samsung says has a 100,000:1 contrast ratio to make blacks darker and whites brighter. The company also said that the display supports a greater range of colors than rival devices, meaning that images and videos should look more natural and realistic on the Tab S versus its competitors. In our brief testing, it seems to work. Colors are bright and vibrant, but also somehow closer to real-life than the iPad mini when placed alongside. It’s also pleasingly responsive to the touch too – the lightest of brushes is all you need to carry out any task. With media consumption high on the agenda for these tablets, Samsung’s also thrown in some adaptive screen software to automatically adjust the gamma, saturation and sharpness based on things like the ambient lighting and which apps you’re using. There are also pre-set modes optimized for watching videos or looking at photos. Beyond the screen, other key hardware specs include an Exynos 5 ‘Octa’ processor – a pairing of 1.9GHz and 1.3Ghz quad core processors – or a 2.3GHz Qualcomm Snapdragon 800 chip, depending on which market you’re in. Again, in our testing, this seems to have more than enough grunt to keep the tablet ticking along nicely, although we didn’t get to test it with any high-demand tasks so will reserve judgement for our full review. Like its smartphone Galaxy counterparts, both tablets ship with front (2-megapixels) and rear-facing (8-megapixels) cameras and both will arrive with either 32GB or 64GB of internal storage, plus support for microSD cards up to 128GB. Although the WiFi-only model will ship first, a WiFi + mobile data (LTE) option will follow soon after. Under-the-bonnet, both are running Android 4.4 (KitKat) with a few of Samsung’s software and UI tweaks. Perhaps most impressively, regardless of screen size, both devices measure just 6.6mm in depth, making them some of the thinnest tablets on the market, besting both Apple’s iPad Air and Mini (7.5mm) and Sony’s 6.9mm Xperia Z2. 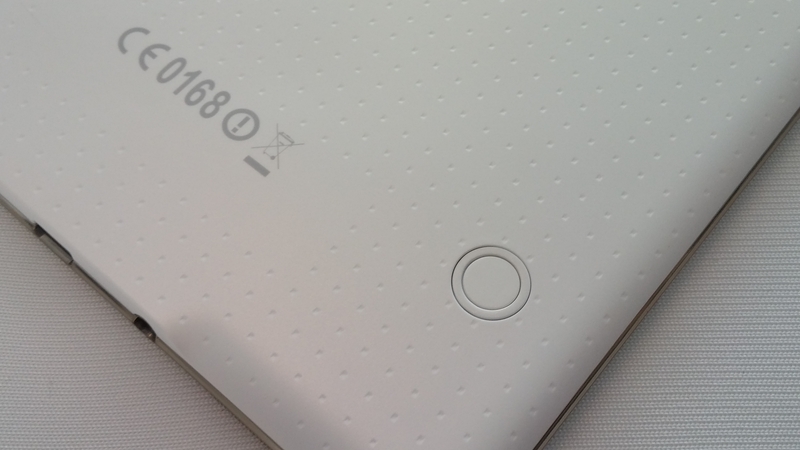 The 8.4-inch version weighs 294 grams, while the larger model weighs 465 grams. What this means in reality is that both are light enough to use with one hand and that the smaller of the two can viably be carried around in a jacket pocket, which isn’t always the case for an 8-inch or so tablet. Beyond the hardware, Samsung has added a few new features for its consumer facing devices, such as a new magazine service called Papergarden. Timed nicely for the beginning of the World Cup today, another of the new additions is Kick, a highly detailed and customizable soccer news and info app dedicated to keeping interested users up to date on The Beautiful Game. 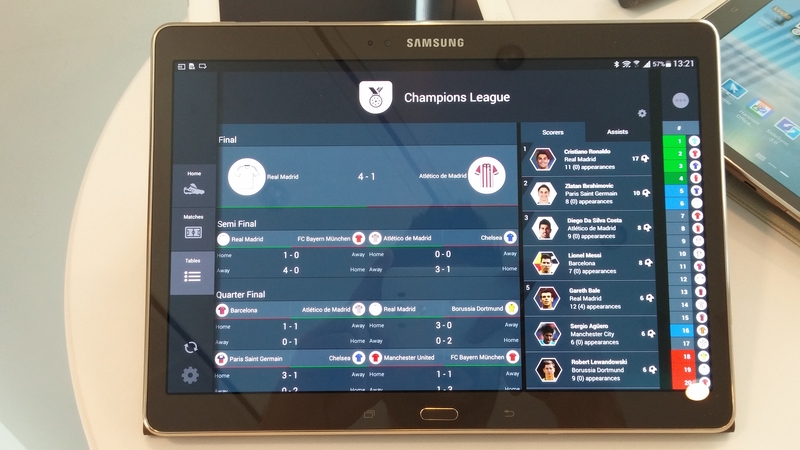 More than just scores and fixtures – which are included, of course – users can drill down to get in-depth information about teams and players, check out and create leaderboards, watch HD video clips and more. And if you’ve got one of Samsung’s 2014 edition TVs, the app will soon be available there too, so you can overlay the information during live games on the big screen. 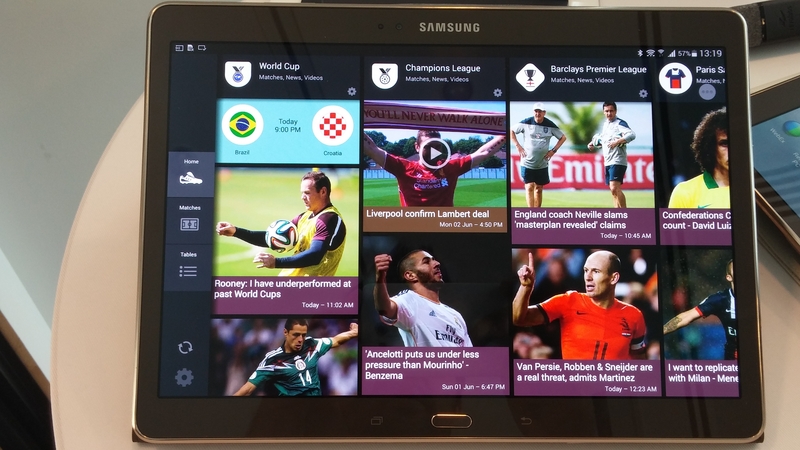 For non-football fans, there’s a range of ‘Galaxy Gifts’ – which are either trial versions popular apps (like six months free premium subscription to Pocket or The New York Times, among others) or free game downloads and in-game content. Also nestled under the Galaxy Gifts banner is Kindle for Samsung, which the company says will deliver a Tab S-optimized free book via Samsung Book Deals each month. Given that the focus of the device is movies and TV, it’s nice to see it’s one of the few Android tablets to support HD Netflix streaming, too. 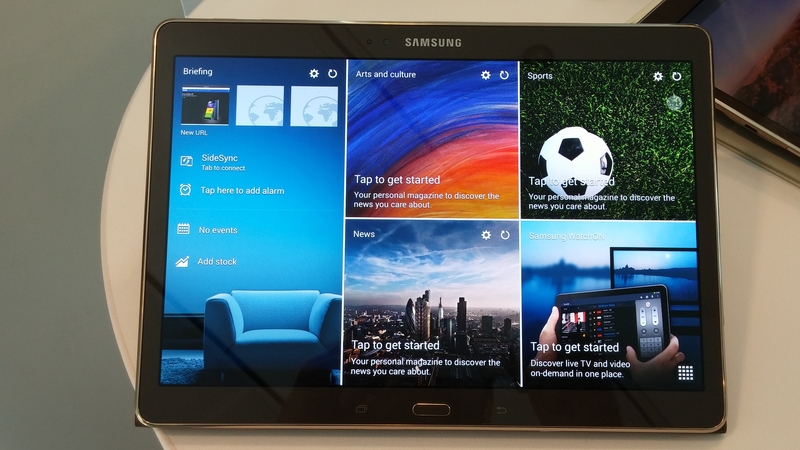 As well as the new options, Samsung’s retained some of its more popular existing features from previous smartphones and tablets too, like side-by-side multi-tasking and its SideSync feature, which allows you to use your tablet as a bridge to send and receive calls and messages when you’re not physically with your Galaxy smartphone. 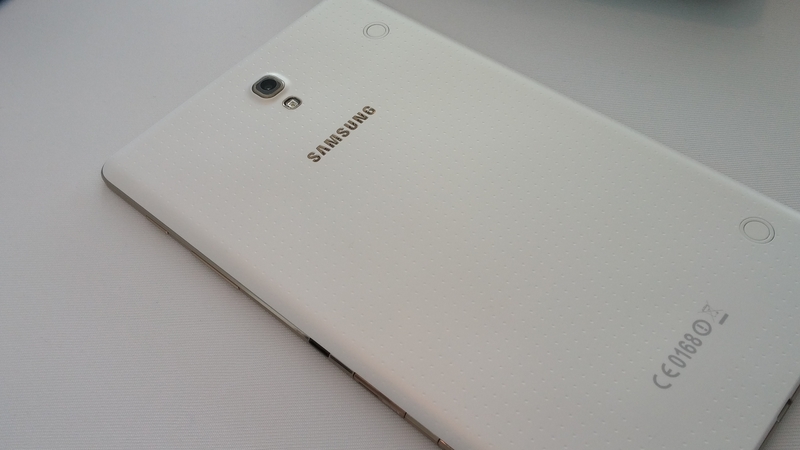 Non-Samsung smartphones are out of luck, though. There’s also the previously seen multi-user mode – so you can have separate profiles set up on the device – and Kids Mode, which keeps your content and services safely away from younger users. Handily, each of these three modes can be tied to the fingerprint scanner buried in the Home button, so the correct profile is easily accessible by each user. 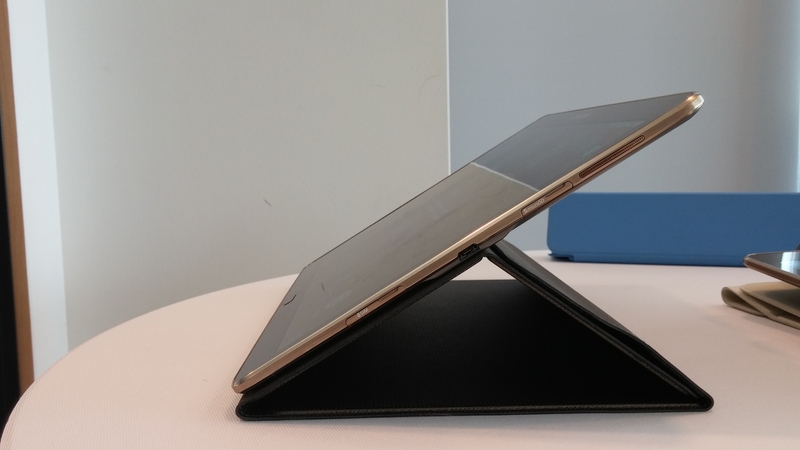 Alongside the new devices, Samsung also launched new covers for the tablets, which act as multi-angle stands, allowing for placement in one of three positions. 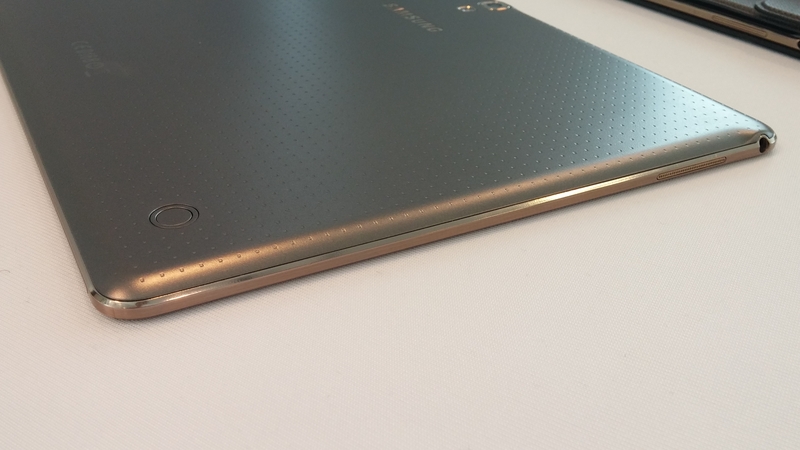 Rather than using magnets to attach to the device, which Samsung says can result in scratches, the Tab S uses a small plastic hook on the case itself to lock onto two anchor points on the rear of the tablet. Pricing for the cases hasn’t yet been announced. Both devices will be available beginning July 4 in Europe, with the 8.4-inch WiFi-only model priced at €399/£349 and the 10.5-inch version €499/£449. A Samsung spokesperson said the WiFi + mobile data models will cost around €100 more than these WiFi-only versions. Samsung is clearly going after the consumer market with these tablets and while our first impressions are positive – particularly when it comes to that display – there’s some overlap (and therefore potential confusion for buyers) between Samsung’s own devices, let alone competitors’. Will the average person really know the difference and relative merits between the Galaxy Tab Pro 8.4 /Tab Pro 10.1 announced in February and the Tab S 8.4 and Tab S 10.5 launched today? They also cost about the same amount, which doesn’t help things much. Nonetheless, if potential buyers can successfully navigate Samsung’s extensive ranges and are considering something other than an iPad – like it or not, it’s the default for many people – on the surface of it the Tab S models are true competitors in almost every way. They’re thinner, lighter, well-specced and around the same price as the comparable Apple tablets. 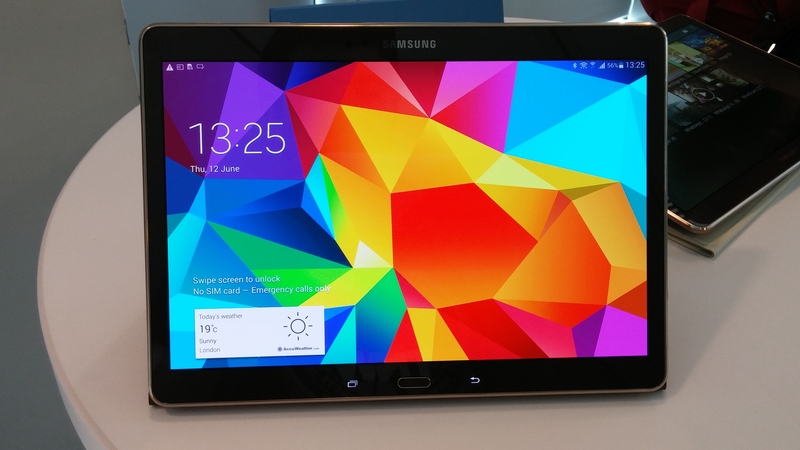 And if Samsung can win that particular battle, that’s a significant percentage of the tablet market right there.